← Picking up the slack! Wow, the final instalment of the Elemental series. I have to say that I am sad that it is over but this final book was worth the wait. I really enjoyed reading Michael’s story. It is interesting the way the author teased us with Michael when she started the series with the novella Elemental. It is fitting that she wrapped it up with his whole story. I think my only criticism was that the romantic element with Hanna was a bit of a letdown. I get that the story was way more involved to sensationalize the romance, but I liked the connection that Michael and Hanna shared and I kind of hoped that she would be the one to help him be stronger. Her character seemed a bit self absorbed and not worthy of Michael for me. The book focused more on the relationships between the brothers, which was equally as compelling for me given that I come from a large family. The family dynamic is very fun to watch play out in this book and the whole series for that matter. And holy cow the drama/action/suspense and everything that makes this series fantastic was certainly evident in this final installment. It is nonstop from cover to cover and never a dull moment. 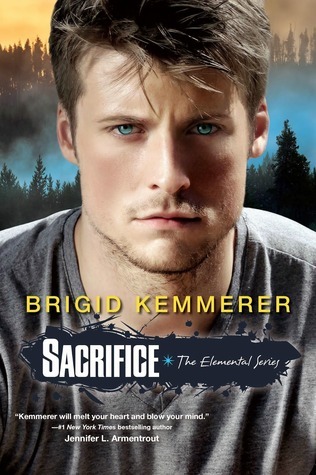 This entry was posted in Reviews and tagged Brigid Kemmerer, Cynthia Stacey, Sacrifice (Elemental #5). Bookmark the permalink.